With the highest pixel density yet in our ColorEdge lineup at an astonishing185 ppi, 4K image display has never been so smooth. Now you can enjoy the exceptional detail in high-resolution photographs that cannot be reproduced with a standard monitor. Alphanumeric characters and contours are also distinguished with excellent sharpness for the printing workflow. 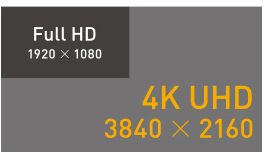 The 4K ultra-high-definition (UHD) screen (3840 × 2160) is four times the size of full HD (1920 × 1080), making it ideal for high-resolution photography or as a reference monitor for 4K video creation. 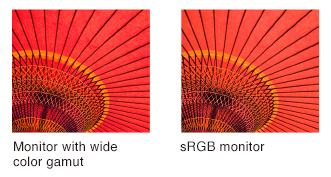 Reproduce the sky blues and lush greens that standard sRGB monitors cannot with the monitor's 99% Adobe RGB coverage. Images shot in RAW can be converted to Adobe RGB or images shot in Adobe RGB will be displayed correctly. The wide colour gamut also ensures that the monitor covers 100% of the Rec. 709, EBU, and SMPTE-C standards as well as 93% of the DCI used in post production. Whether you are working with photo, video, or print, this monitor ensures faithful colour reproduction for a multitude of creative industries. 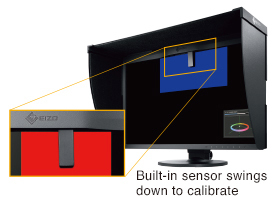 Automate your calibration with the built-in calibration sensor that eliminates the time and effort of an external calibration device. 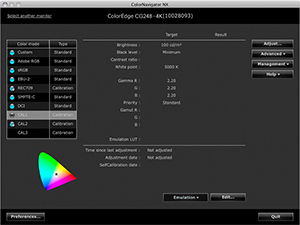 With the dedicated ColorNavigator 6 and ColorNavigator NX software, you can schedule the monitor to self-calibrate at specific times so you can always be sure that images are displayed with exceptional colour accuracy. 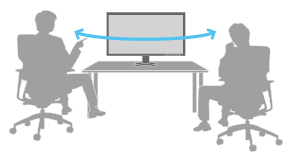 The monitor will stick to its preset schedule even if it is switched off or not connected to a computer. 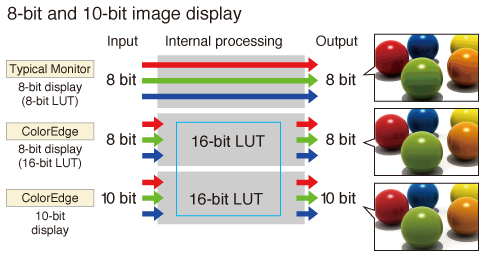 The high contrast ratio of 1000:1 produces true blacks that are otherwise difficult to display on a typical LCD monitor. The dark tones retain their depth even when viewing the screen from an angle in a dimly-lit studio. Fluctuations in brightness and chromaticity on different parts of the screen are a common trait of LCD monitors. 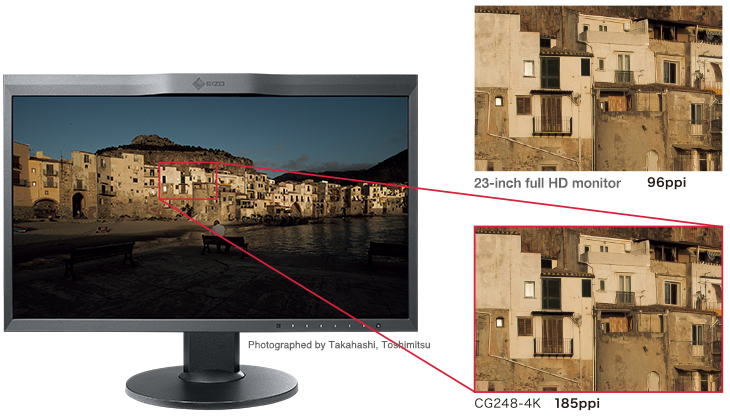 To counteract this, the CG248-4K incorporates EIZO's patented digital uniformity equalizer (DUE) technology to ensure a Delta-E difference of 3 or less across the screen when the monitor leaves the factory. DUE also counterbalances the influences that a fluctuating ambient temperature may have on colour temperature and brightness to ensure stable image display. With 10-bit simultaneous colour display* from a 16-bit look-up table, the CG248-4K can show more than one billion colours simultaneously. 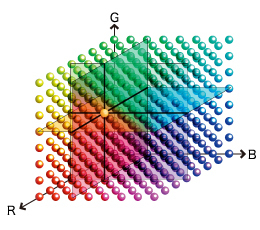 This is 64 times as many colours as you get with 8-bit display which results in even smoother colour gradations and reduced Delta-E between two adjacent colours. With ColorNavigator Network software, an administrator can centralize management of all CG248-4K and other ColorEdge monitors on a network. For example the administrator can self-calibrate, set colour modes, register or edit asset management settings and other tasks whether the monitors are local or remote. This ensures that monitors always have the proper settings and saves hundreds or even thousands of hours in annual maintenance time. Preset modes for EBU, Rec. 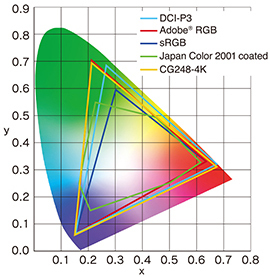 709, SMPTE-C, and DCI ensure you can work in the appropriate colour spaces and gamma values. Simple select the preset via the buttons on the front of the monitor. With the built-in calibration sensor, you can adjust or maintain the brightness setting for each preset. Enlarge areas of the screen to confirm small details and check focus accuracy in photos using the 4K zoom function. 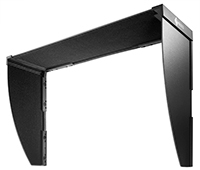 It is quickly and easily accessible using the monitor's front buttons. Visit this page to check graphics card compatibility for the CG248-4K.